I met this therapist on Tuesday. It was ____ too many words to actually be able to choose just one. She said that in therapy you have to look back at all that happened to you and revisit it all. I completely disagree. I think that there are so many people who think that in order to go forwards you have to go back. That you have to revisit everything that happened. And I think they’re wrong. If you ask me, life is about moving forwards. Not back. Living with the reality. Living in the present. I’ve always felt that therapy is about taking where you are and going from there. That revisiting what was isn’t going to give you the tools or skills you didn’t have then. Revisiting the past won’t change it. It’ll just bring you back there. Rather than to the present. You live, I live, we live, in the present, in reality. Why go back there? I think there’s a line though, because sometimes we have to revisit it. To process it. To accept and acknowledge what was. 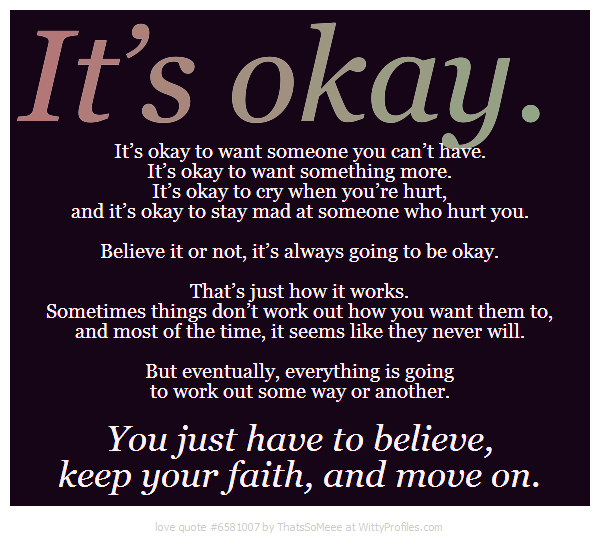 To be okay with it. To forgive. To let go. To move on. Which means that when you remember something, feel what you want to. Or for example, when I was reminded of my sister when I was 9, I told my friends. I journaled about it a lot. I wrote to the 9 year old E. Not that I’ve really forgiven everyone or let it be. But one day I will. That’s not what therapy is for though. Therapy is about moving forward. That’s what I think anyways. Tired and confused and came across lots of cool quotes. Well you know me, Eliza, I believe in staying in the present. But that being said, I do believe that sometimes we have to visit the past to see what happened, what went wrong, so we don’t keep making the same mistakes. Sometimes we set up a pattern in our lives that we just don’t recognize or realize. I used to tell my mother to just take a visit to the past but don’t stay too long. I like that one – visit it but just as a visit without living there. I agree that going back isn’t always the answer. Sometimes standing still is enough.? Aww, thanks! Sometimes we just need to breathe in the awesomeness of the world around…. For me, I don’t have access to very many memories. Most of what is surfacing right now for me are somatic or body memories/stored emotions completely disconnected from memories or words. It’s not helpful for me to try to relive traumatic memories because any time I get close to remembering I go into fight/flight/freeze and my prefrontal cortex shuts down — so I can’t process anything in that state. Instead, I am learning how to be curious about emotions that arise from triggers in my current everyday life, and am developing tools to help me cope with these triggers and emotions without dissociating or numbing. I agree one has to process it. Just not so sure that one can’t do it on ones own. Then what is therapy for? Um, I don’t know! for me, all my issues are because i am stuck in a moment or moments that happened long ago. if i am not there now, i cannot leave. but if i go back there am i going to just stay there or move forward? i want ot go back and be there so i can move forward. just trying to move forward from the present present has never worked for me because it is as if i’m attached to a chain fastened to the past and it always pulls me back but not reaching a true starting point. i think going back to the past is necessary in order to move forward but you must move forward. 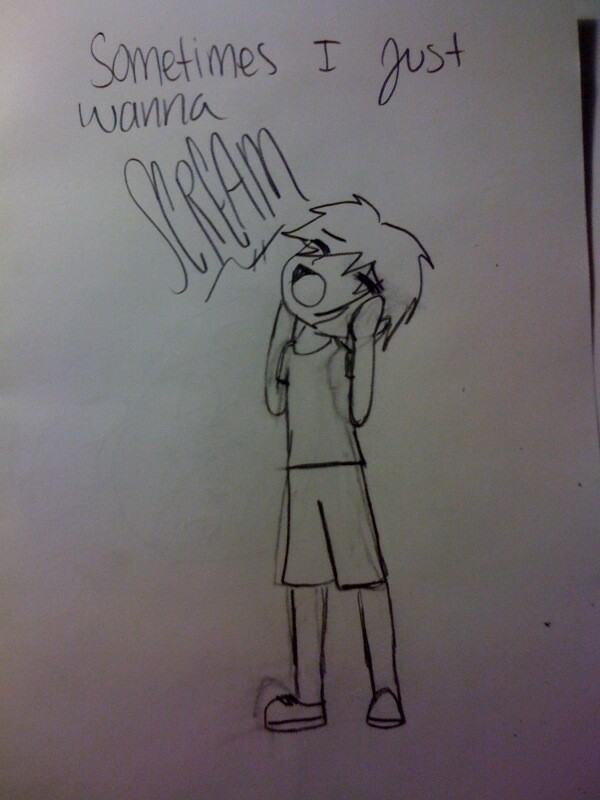 I saw that ‘sometimes I just wanna scream’ sketch and I thought how well that summed me up the past couple of days. It is perfect to answer your question.